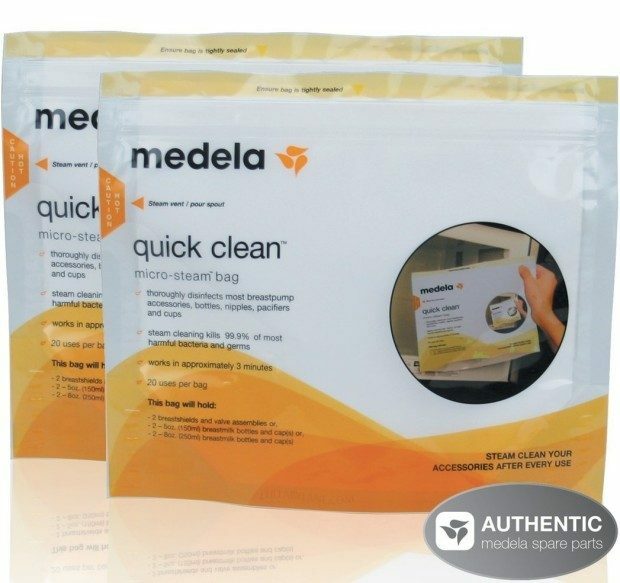 Medela Quick Clean Micro-Steam Bags - 2 Pack Of 5 Ea Only $10.35 Shipped FREE! You are here: Home / Great Deals / Amazon Deals / Medela Quick Clean Micro-Steam Bags – 2 Pack Of 5 Ea Only $10.35 Shipped FREE! Medela Quick Clean Micro-Steam Bags – 2 Pack Of 5 Ea Only $10.35 Shipped FREE! Head to Amazon to pickup the Medela Quick Clean Micro-Steam Bags – 2 Pack Of 5 Ea Only $10.35 Shipped FREE! Very highly reviewed! Buy the 2 Pack and Save!! Quick Clean products are convenient to use anywhere, anytime. Clean breast pump parts and other feeding accessories in just 3 minutes with these revolutionary bags: Simply place items in the bag, add water, and heat in the microwave.